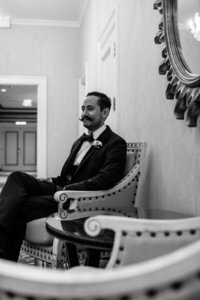 I’ve had the pleasure of shooting weddings at the Fairmont San Francisco and let me tell you, if you want the ultimate elegant wedding while being truly unique to San Francisco, this is the place you need to get married. It is full of details, beautiful architecture, and each room is versatile. The staff is also wonderful to work with. Situated next to the historic Grace Cathedral, sitting atop Nob Hill with views of Downtown, you’ll feel like you have a true San Francisco experience to share on your wedding day. There isn’t a bad view of the bustling city from any of their rooms. Photographing these views is always something I look forward to! They also have a ballroom, a historical penthouse suite, and a rooftop garden, which is a lovely spot for wedding day photos. There are so many different locations within the historic building that you can find the perfect location for your wedding. Ornate, gold leaf bas-reliefs decorate this ballroom’s walls. As your eyes look upward you see indoor balconies, a gilded ceiling, and crystal chandeliers that add to the turn-of-the-century French provincial theme. This ballroom has hosted a number of performances, including Tony Bennet’s first time singing “I Left My Heart In San Francisco”. 22-foot tall ceilings create an ambiance of airy elegance. It makes for wonderful dancing photos of your wedding guests if you have a live band at your reception. Spanning the entire eighth floor (roughly 6,000 ft) of the historic Main Building, this jaw-dropping suite features three large bedrooms, a living room with a grand piano, a formal dining room, and a terrace with views of the city and the bay. Oh, and a billiard room. The “WOW” factor is the circular two-story library, crowned by a rotunda with golden constellations. Leather-bound books line the walls as a stairwell and balcony allow you access to the second story. I had the pleasure of being the photographer for two Historians in this room! This room was designed with weddings in mind. You can really see the whole city and get a wonderful 270-degree view with its windows wrapping around the room. Looking through the windows, you see both bridges, downtown, Coit Tower, and Alcatraz. These views make for spectacular memories to be shared with you and your soon-to-be husband/wife, and all your guests. I absolutely love this venue and love to capture all of the details that weave through your wedding story. When I photograph a wedding here, I focus on capturing not only your guests and bridal party, but also the charm of the venue and how your wedding relates to the space. Hopefully, this guide has helped answer why you should be getting married at the Fairmont San Francisco. Now the question is: Which room will you host your wedding? WOW! 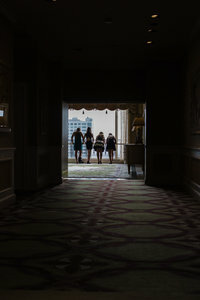 The Fairmont in San Fransisco is Gorgeous and what an amazing place for a wedidng! I need to get married again! this time on the West Coast! What a fantastic blog for couples looking for truly gorgeous wedding venues in San Franciso! The Fairmont in San Francisco is so elegant, it just looks like a dream to photograph! And I love this blog. So concise, beautiful photos. Really well done! Such a great overview of The Fairmont for anyone looking for an elegant wedding in San Francisco! Pay attention brides! 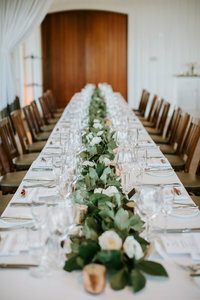 This photographer’s review of The Fairmont in San Francisco has the inside scoop on where to get married in San Francisco! Plus the elegant Fairmont is beautifully photographed by Amy Thompson, with a true eye for capturing this sophisticated and modern wedding venue. Love this! Thank you for all of the information and lovely photos about getting married at the Fairmont San Francisco. It looks like a truly unique and amazing place for a wedding in San Francisco. I hope to go some day. OMG The Fairmont is THE hotel to get married at in THE CITY! Historic, lux and luxurious, every room is beautiful and truly can represent any couple in San Francisco. Any wedding at the Fairmont will be stunning! Haha I was sold in the first photo! What a great way to showcase the Fairmont as the best location for a wedding in San Francisco. Thank you for sharing, Amy!